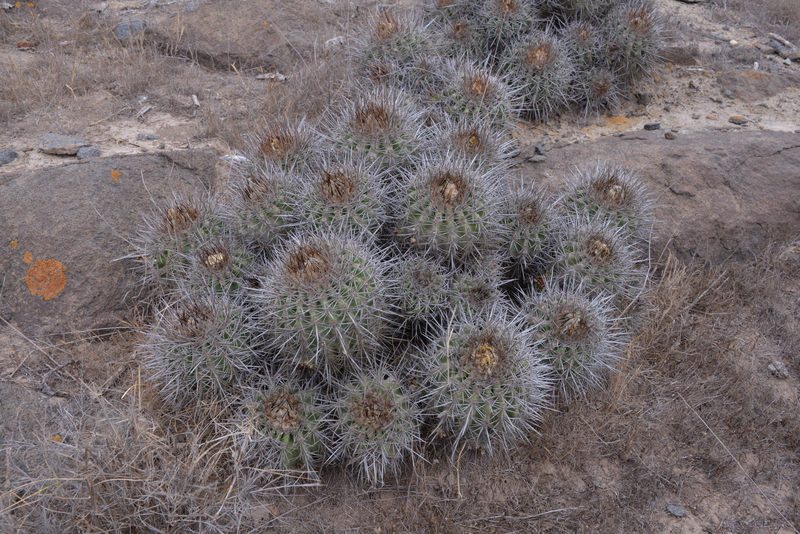 I should have mentioned that a shortness of accommodation in Guanaqueros had been solved by Bart & Marijke checking into a large cabana – up to 6 beds, so that after the wine and beers we could have a sound sleep. The morning plan was shopping at Jumbo – which I thought was in Coquimbo but actually turned out to be in the Coquimbo end of La Serena. We caused a huge queue in the restaurant as we tried to work out what was what and which of these we wanted for breakfast – everybody was very patient and the Chileans behind us gave us a round of applause for persisting with our Spenglish – and for clearing off to our tables. Past Los Hornos there is a turning to a track to Chungungo that we had taken (in the opposite direction) in 2001. 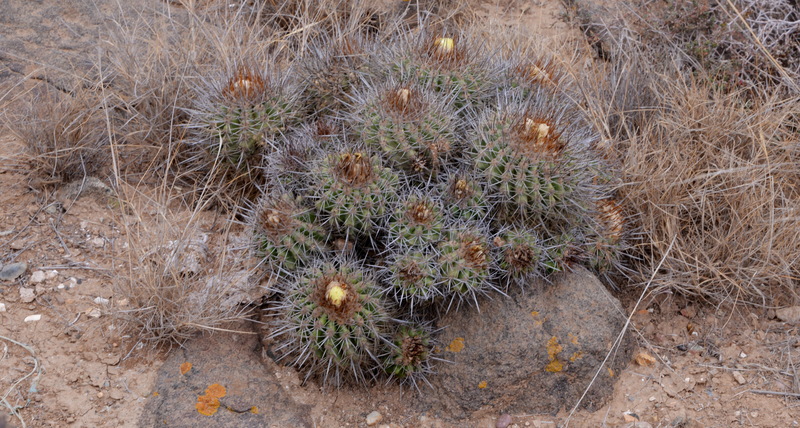 It’s alongside a stretch of R5 where we’ve often admired the camanchaca clouds pouring over the hills and with our regular Los Hornos stop taken out by the road widening scheme, we needed a new spot to take a look at the local Copiapoa coquimbana etc. Bart & Marijke had been up this track in 2012, while I had been in South Africa so could report that the quality of track was much improved. 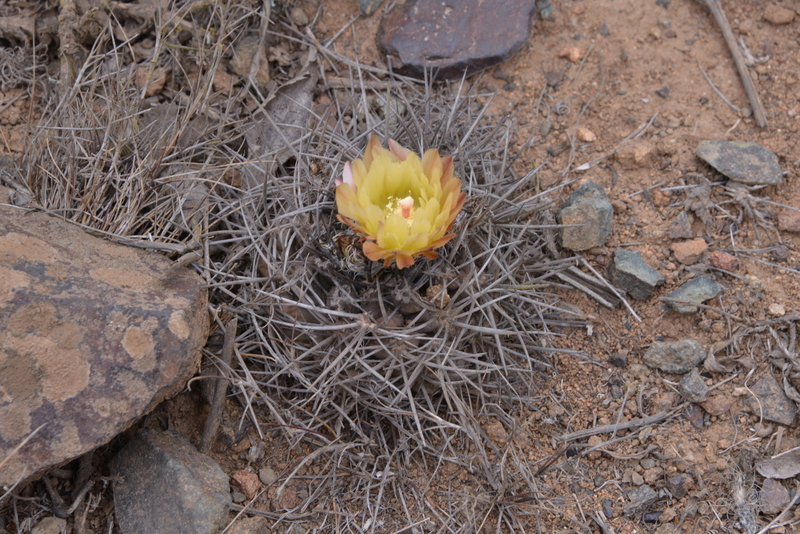 We stopped soon after the coquimbana appeared (S2888) – the first for Jonathan, together with an Eriosyce ‘ball of spines’,and Echinopsis (Trichocereus) some with one side covered in bright red fungi or lichen. We stopped again a little farther along the road (S2889) as we had now reached the point where the road was about to disappear into the clouds. 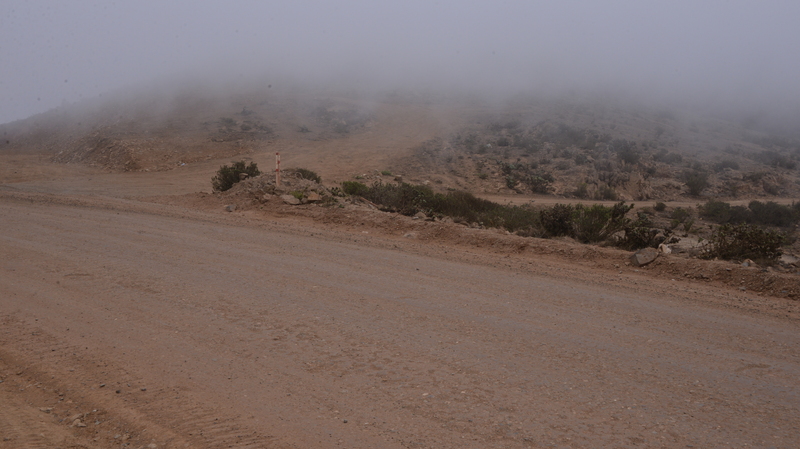 I’m still collecting images and movie clips for a talk on Fog, so the scenes here were magnificent. 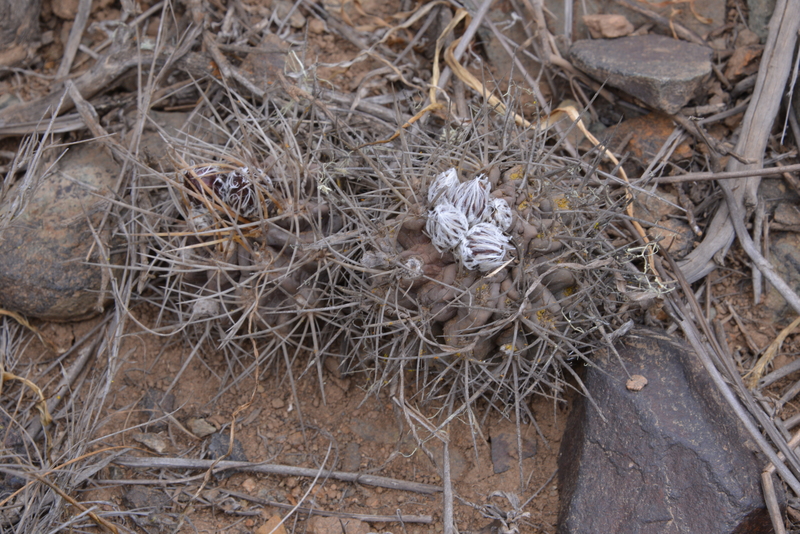 There was also an Eriosyce (Horridocactus) sp here, in flower, and different from ‘ball of spines’ encountered earlier. 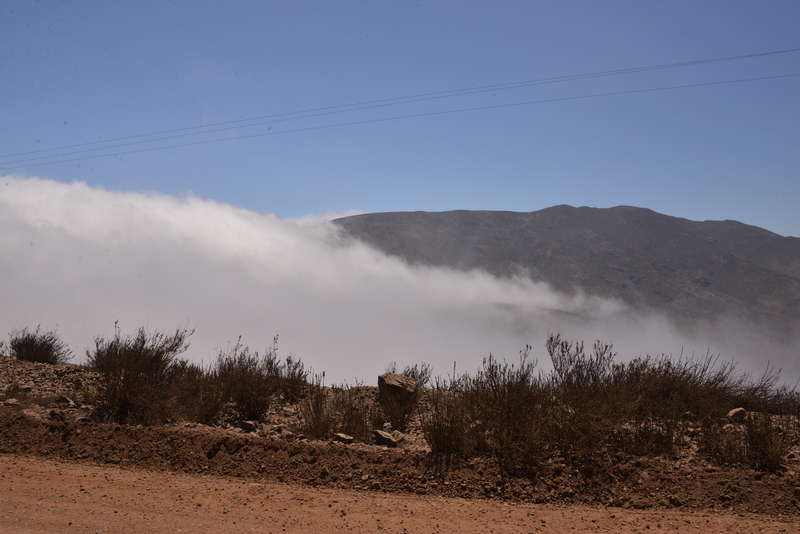 We made several more stops (all still filed under S2889) to film the fog and arrived safely back on Ruta 5. This time I was determined, with Jonathan’s help, to get shots of the lorry park that now sits on the Eriosyce riparia site (S2890) and between us we did a great job, I slowed down sufficiently to give JYC a better shot at things and he clicked the shutter at furious speed so I know have some images of doom. I wonder if the various organisations concerned with the road building scheme were aware of the plants and had arranged for them to have been moved to a safe place. 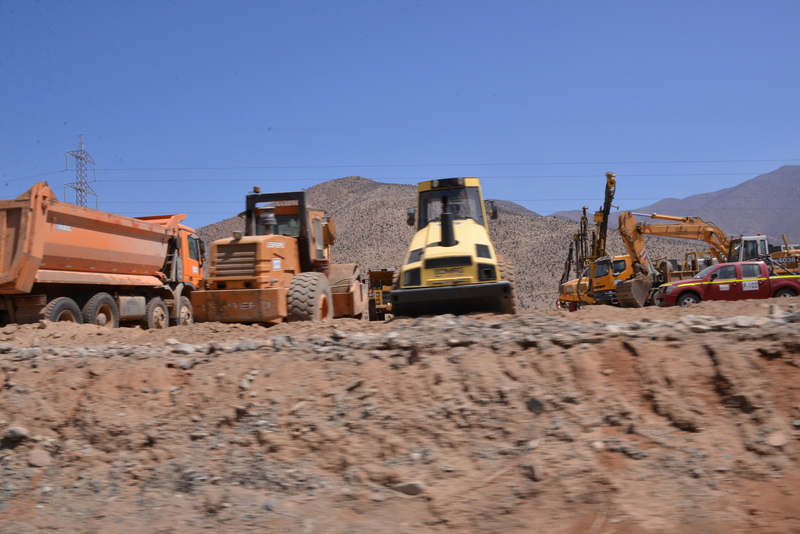 That’s the danger of our phobia to keep plant locations secret so that they do not disappear through collecting – nobody else is aware where they grow and then we cry when a new road is laid right over the top of them! 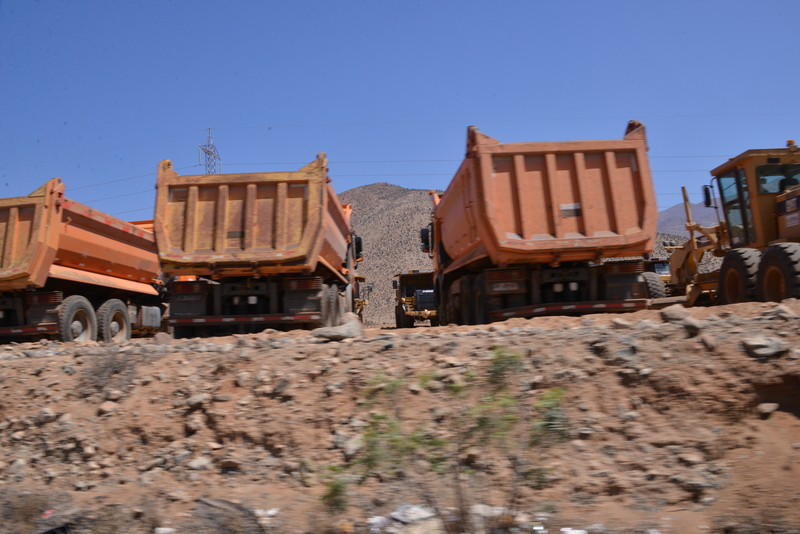 We got stuck for a while behind a big lorry that was going too fast to manage an overtaking manoeuvre and too slow to not be a nuisance, but made the Vallenar crossroads around 4 p.m. Opposite (south of) the familiar Copec station is a very nice restaurant / snack bar that according to Bart & Marijke had been here for quite a while – perhaps the restaurant that the taxi drivers had meant to take some of to in 2003? They were probably too embarrassed to find it closed and had just dumped the passengers off. We had a very nice large Expresso and not knowing how to order 4 slices of a cake covered in slices of peaches, I had ordered the whole thing – with half of it neatly packed in a cake box for a mid morning snack tomorrow. While preparing to go out for dinner, I had an email from Brendan & Lucy, announcing that they were in Vallenar, ready to go out for a Pizza. We managed to get hold of them on Jonathan’s phone and have planned to meet up with them at the famous Huasco napina stop around 9:30. 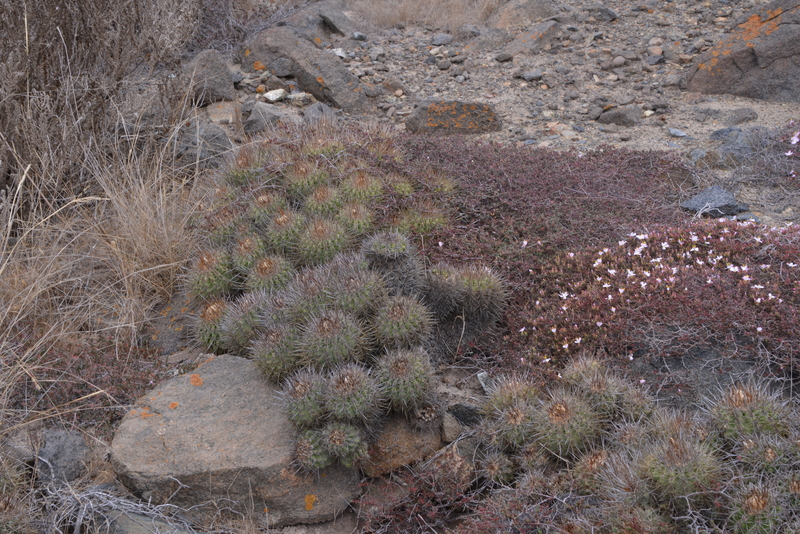 And so, what had started as me on my own for 5 weeks in cactus land was growing into a small party of 3 cars with 6 people. Roger & Pam, if you are reading this, there’s room for more! !